We speak to Nabihah about her recent trip to Russia and her debut album "Weighing Of The Heart"
We were delighted to have Nabihah Iqbal in Russia to perform at Synthposium earlier this year. For the last three years, Synthposium has brought producers, fans, musicians and connoisseurs of analog and modular synthesizers together with shows, guest speakers and workshops. This year, we invited Max Cooper and Nabihah Iqbal to perform and Dr Matthew Sweet and the London Modular Alliance spoke about topics including “Brits in Space” and the evolution of interactions between humans and machines. Anyone who has followed Nabihah Iqbal’s music to date will be familiar with her considered, tasteful music which marks her out as a producer with a distinct musical personality and no shortage of wit and wry humour. 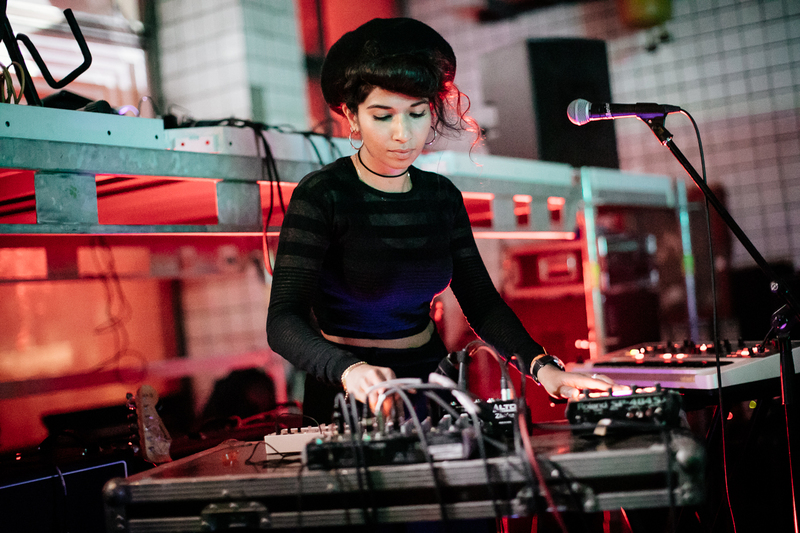 Earlier this year she dropped her former stage name, Throwing Shade, in favour of her real name and now “proudly wears [her given name] as a female British Asian artist making electronic music.” Her new album, Weighing Of The Heart, is out on 1 December and the first single, "Something More," signals a move into new territory. We caught up with her to find out more about her time in Russia, her NTS Radio Show and the new album. After all, it’s not every day you get to speak to a producer who’s also a trained barrister with a black belt in karate. How was the crowd in Russia for Synthposium? Was it very different to playing in the UK? The trip to Russia was amazing. It was my first time playing live there, and the Moscow crowd were very welcoming. It felt like a good show. It was definitely very different to the UK but in a good way. There is a strong energy in the Russian music scene, maybe because it's so local, and it feels like everyone is supporting each other, trying to make things happen and putting on cool parties. The setting for my live show at Synthposium was very memorable: inside a huge abandoned factory! You would never get anything like that in London. The setting for a music show or festival is so important and this industrial backdrop made everything feel more raw and exciting. I much prefer things that feel secret and DIY, rather than overcooked. Can you tell us a bit more about the NTS show you did last month with Nastya Mikhaylova? Some really interesting music in there! I've met Nastya a couple of times: at Synthposium and also last summer when I DJed at Strelka in Moscow. I get on really well with her and I think she's such a cool DJ, who has a deep understanding of music. On my recent trip we were talking about Russian music, and her own background and then I had the idea to ask her to do a guest mix of 100% Russian music for my NTS show. I was so happy when she agreed. People who listen to my show will know that it's all about sharing music from all around the world, with no boundaries, and it's so nice to be able to feature guest mixes from DJs from other countries, who will be able to showcase their local music much better than any outsider. You seem to have an insatiable appetite for music from around the world – which we hear in your NTS shows. What is it that keeps you searching for new sounds? It all comes down to an unrelenting appreciation of music. If you like music, you have to be open-minded, and as soon as you gear your mind up for exploring sounds from different countries and cultures, it is such an enriching experience. I'm always so curious about music from different places, and I guess this is what makes me want to find out as much as I can. Who do you most like listening to and why? I can't choose one thing! It depends on the time, place, and mood I'm in. But when I listen to music, I like to concentrate on it, so I need to be in the right frame of mind. I can't put something on “in the background”. What can people expect from your new album? Is the single “Something More” indicative of what’s in store? With the big guitars and drums to the fore it seems to be in a different place sonically compared to House of Silk? “Something More” is a good indicator of the direction my new music is going in. It definitely marks a shift from everything I've put out previously but I think there are still some similar motifs which I carry forward. On my new record I wanted to use a lot more live instrumentation, so you'll hear guitars, drums and a lot more vocals too. I hope people will be surprised in a positive way! Looking at things you’ve done in your life – trained and worked as a barrister, become a black belt in karate – it seems like you have huge determination and persistence once you put your mind to achieving something. Where do you think that comes from and what’s your ambition for your music? It's hard to say where it comes from. Some of it is definitely down to the work ethic that my parents instilled in me as I was growing up, but the rest comes from somewhere else inside my conscience. I feel like if you don't work as hard as you can, and try and do the best that you can, what's the point of doing anything? There's always room to improve and become better at whatever you do and so I feel like we all need to strive towards that. I feel very lucky and privileged to be in the position that I am, being healthy, living in a great city like London, being able to concentrate on music which is my most favourite thing in the world, so I just want to be able to make the most of the opportunities that I've been given. These are the things I think about every day and it gives me the motivation to go into the studio, or focus on whatever else I'm doing. Any shows or projects coming up you’d like to tell us about? At the moment, I'm concentrating on the live arrangement for my album, working out exactly how I'm going to perform the new songs ... it's a pretty big task! I'm giving myself the next couple of months to prepare and then, all being well, I'll do my first show in January 2018 in London. Weighing Of The Heart is out on 1 December via UK record label Ninja Tune.